Teachers and producers from Radio Ucamara take a group photo outside the station in Nauta. They research and broadcast community engagement projects, including an initiative to revitalize their native language of Kukama. 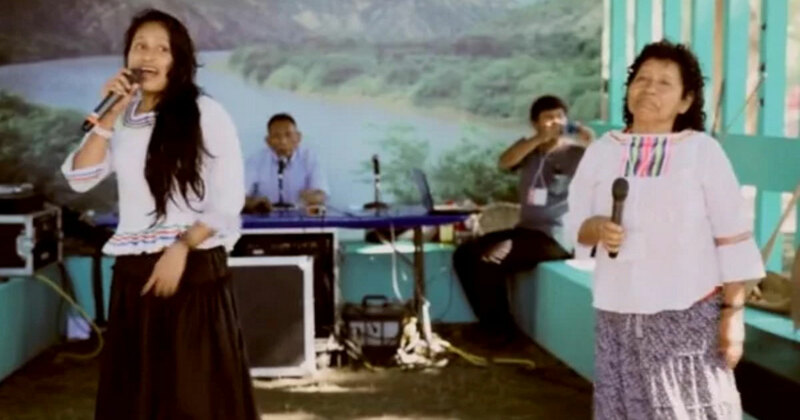 Radio Ucamara started in response to the needs of the Kukama people, an indigenous community on the banks of the Ucayali and Marañon rivers in the Amazon. Since the eighteenth century, the Kukamas have been threatened by colonization, rubber and oil exploits and subsequent pollution, as well as political marginalization. In light of these pressures, the broadcast radio station develops projects to reinforce indigenous empowerment, revitalize language, and sustain cultural traditions. These projects include managing the Ikuari School for elders to teach the Kukama language to children, producing music videos, and hosting radio programs in Kukama on essential issues in the community. Using participatory methods actively involving the community, Radio Ucamara is concerned not only with keeping the culture alive but connecting traditional Kukama world views and oral traditions with the problems they face today. Inside the Radio Ucamara studio.